Discussion in 'Events and Tournaments' started by Magnetic, Mar 14, 2019. 1st place: full set of elegant (umlimited). 2nd place: full set of elegant (90 days). 3rd place: full set of elegant (30 days). OBS: If your reserver wants to be rewarded, he/she must play one game atleast. What are map pools? : So it's gonna work like this, there are 7 maps given for each mode which is called map pool, there the both teams will bann each time until there's 1 map left, which will be played. Round 1: Bomb Battle / 5 Rounds / 3 minutes. Semi finals: Bomb Battle / 5 Rounds / 3 minutes. Finals: Bomb Battle / 5 Rounds / 3 minutes. 3;rd Bronze: Bomb Battle / 5 Rounds / 3 minutes. Accesories: ONLY Sniper / Shotgun / MicroGun / Rifle bullets. Melee: Folding Shovel, MP Steel Hammer, MP Mad Wrench, MP Chain Saw. Rifle: Cricket, MP Pepper, MP Hornet, MP Sherlock. Shotgun: Zolo, MP KW-79, MP Bombard, MP Driver. Sniper: Jam, MP Sea Eagle, MP Venom. Gatling: MicroGun, MP Daredev, MP Firefly, MP Crank. Bazooka: Sting Ray, MP Mimic. Grenade: Hot dog, MP Pulse, MP Exile, MP Thunder. -The lowest level to participate is 15. -If a team doesn`t show up, it will be replaced by a reserve team. -Only items / characters that were mentioned above are allowed. -In case you get a disconnect during the match, you are able to re-join the match. -The participants are not allowed to switch to another team during the tournament season. -In case of draw in Bomb Battle, we will count the missions. -If you have more than 300ms, you’ll be forced to leave after 10 seconds, otherwise you will be disqualified. -You are not allowed to rejoin the room if you are low HP, for example in TDM. - Sharing accounts during the tournament is absolutely forbidden. -Breaking any rule will get you disqualified for that round. We [the names of the players in the team] agree to play The invasion tournament, we[the names of the players in the team] also fully agree with all the rules. 7. Marlboro - Didn't show up. 1. CoilingDragon - Didn't show up. 2. Cuties - Didn't show up. 4. Sperma - Didn't play. 5. EastSide - Didn't play. 6. (JustForTheTicket) - Didn't play. Wish you all good luck and have fun! sesh, Bahamut and Arata like this. ApolodoR, Bahamut and Arata like this. We (Izaier, Lyrid, Spooky, Lucilfer, Wolframio) agree to play The invasion tournament, we [Izaier ,Lyrid, Spooky, Lucilfer, Wolframio] also fully agree with all the rules. 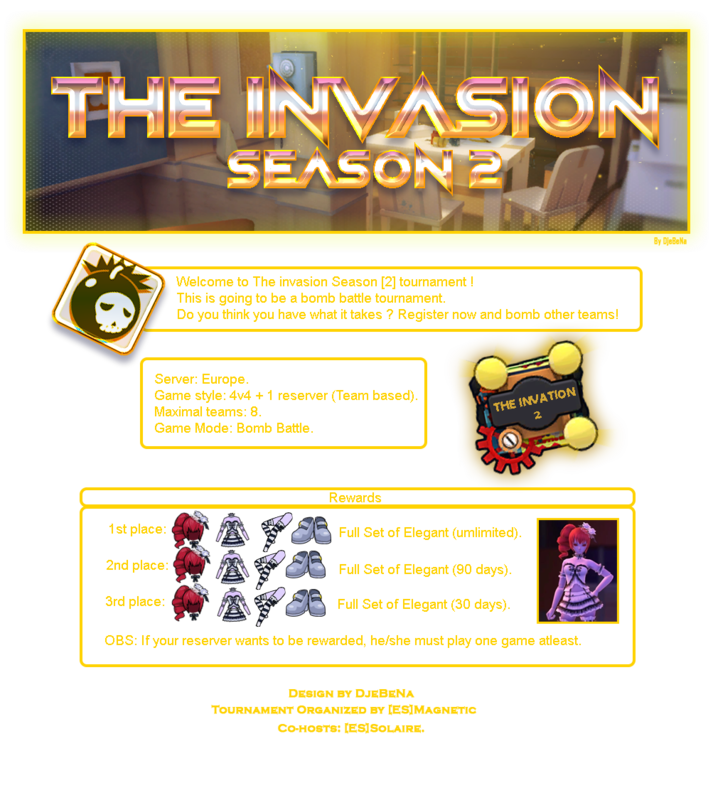 We (Bimmer, Synapze, Hxzzible, Rows, Missing) agree to play The invasion tournament, we (Bimmer, Synapze, Hxzzible, Rows, Missing) also fully agree with all the rules. Acronyum and Magnetic like this. We agree to play The invasion tournament, we also fully agree with all the rules. We(dreaming, Mikey, Zera, Asguardian,exilus & HeavyWay) agree to play The invasion tournament, we also fully agree with all the rules. celaeno, Acronyum and Arata like this. the invasion tournament we (Yitu , Shimakage , forest ,Buddha) also fully agree with all the rules. We [Danny, Dekz, iia, Pepijn, Vulcan] agree to play The invasion tournament, we[Danny, Dekz, iia, Pepijn, Vulcan] also fully agree with all the rules. We iAintGoku, iAintYuga, agree to play The invasion tournament, we iAintGoku, iAintYuga, also fully agree with all the rules. We [MicroJuly, HEXOR, Marvin, iEPIC & BlackBerryCurve] agree to play The invasion tournament, we[MicroJuly, Br3aKheadZ, BlackBerryCurve, iEPIC & JebigaJohnny] also fully agree with all the rules. We (Venious,TBA,TBA,TBA) agree to play The invasion tournament, we (Venious,TBA,TBA,TBA) also fully agree with all the rules. We (SleppyKnights,Cyox,GodShine,,Panq, Swe) agree to play The invasion tournament, we (SleppyKnights,Cyox,GodShine,Swe,Panq) also fully agree with all the rules. Shoudnt the prizes be changed? Everyone has elegant do. He probably meant 15:00 . as in 3 PM. And thats like kinda too late no? Friday or saturday since its early anyways, though israeli people has school on sundays, no? The rewards were changed too. Please notice that the date of the tournament was changed.